1940 Navajo Rug titled "3 Feathers"
This is a rare and beautiful Navajo Rug dating between 1940-50s. Pictorial "3 Feathers" Geometrics with terqouise. One weak spot. Measures 46"X60". More pictures available by request. 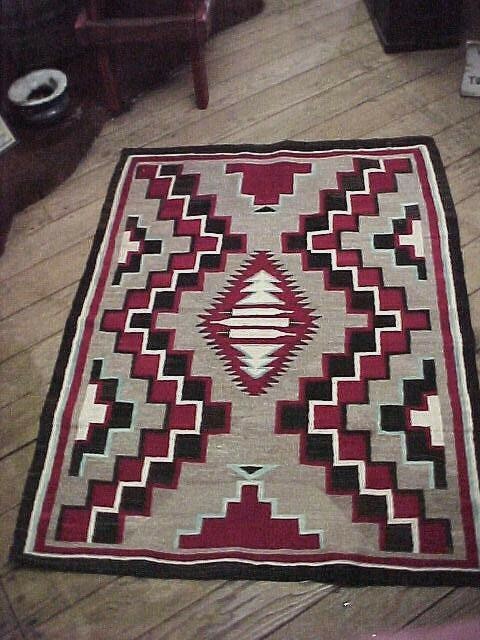 This is a rare and beautiful Navajo Rug dating between 1940-50s. Pictorial "3 Feathers" Geometrics with terqouise. One weak spot. Measures 46"X60". More pictures available by request. Please email cowboycabin@centurytel.net with questions or call 406 270-2842.